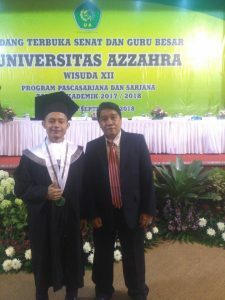 Alhamdulillah berkat karunia serta nikmat Allah Swt, saat ini saya telah Menyelsaikan Pendidikan S1, fakultas ekonomi dengan fokus pada jurusan manajemen. awalnya saya sendiri tidak tau bisa atau tidak Menyelsaikan semua pendidikan ini jika tidak ada bantuan dari Yayasan kampung Kids dan kaka yang telah membantu biaya pendidikan saya sejak duduk di kelas 4 Sd, sampai saya Menyelsaikan perkuliahan saya, dikarenakan keterbatasan ekonomi dari orang tua saya. 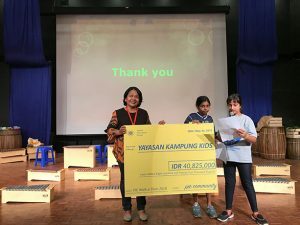 Untuk itu saya selaku penerima bantuan ini mengucapkan terima kasih yang sebesar-besar kepada para pihak yang telah mau menjadi sponsor, terutama dari Yayasan kampung Kids yang juga telah ikut berprtisipasi dalam memfasilitasi dalam membantu biaya pendidikan saya. 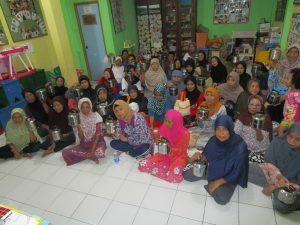 Sekali lagi saya selaku penerima bantuan biaya pendidikan mengucapkan terima kasih dan semoga Allah SWT memberikan balasan yang berlipat atas segela bentuk bantuan yang kaka dan yayasan kampung kids berikan dan mudah-mudahan dicacat sebagai amal kebaikan yang memperberat timbangan amal sudara di yaumul hisab kelak. Amin. 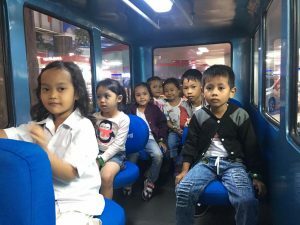 Demikian surat ucapan terima kasih ini saya buat atas bantuan yang selama ini saya terima, . 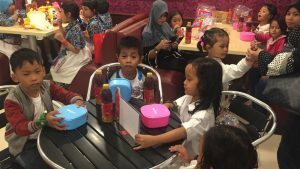 Atas perhatian kaka dan yayasan kampung Kids saya mengucapkan banyak terima kasih. In October last year, myself and Indu Netto, both spouses of husbands working at the NZ Embassy, began our Monday morning routine at Kampung Kids. 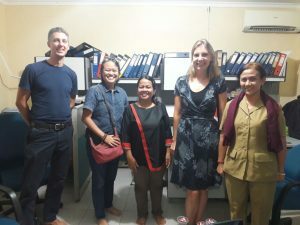 We heard about this wonderful school, through ANZA (Australian and New Zealand Association) as one of the volunteers was returning to Australia and a place became available, we both jumped at the opportunity to meet local Indonesian families and students. 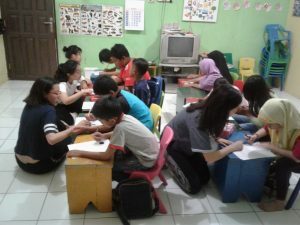 We plan and take an hour long lesson each Monday, including songs in Bahasa and English, words in Bahasa and English and some form of craft activity. It’s a lot to try and pack in an hour but so far, all the students enjoy it and we enjoy working alongside Nawan also. We do have lots of fun!!!! We now know all the mothers who come along and wait outside the classroom really well…a real bonus. Through the ANZA Social Welfare Committee which we are a part of, we have managed to successfully apply for and speak to an application which has secured 10.400,000 for Kampung Kids over a six month period. This money has been targeted for the feeding programme at Kampung Kids. The ANZA social welfare committee though they were a very worthy applicant. I have also applied to through the NZ Embassy HEF (Head of Mission Fund) for further funding for this programme. After meeting with the co-ordinator last week and liaising with Julia, we are trying to make this application fit their criteria better, which is to provide funds for a project with sustainability. 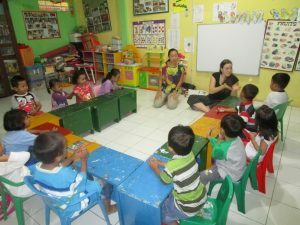 Kampung Kids has a big place in our hearts and we will not stop trying to find ways to assist with funding. Started as a calling of the heart three years ago. It was simple, we just wanted to improve and touch many people’s lives. We wanted to give back to the community in different ways, and Kampung Kids is a community that we have grown to love as our own. Meera Joseph @ AOH Committee. The first time I walked through kampung Pejaten Barat, it seemed impossible not to get lost in the branches of narrow paths that spread through this densely built area. After having visited several times one could start to sense that there is a tightness (strong interdependency) in the community and that the many great smiles, seem to conceal the struggles that a lot of the people in this community face on a daily base. 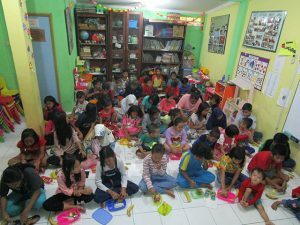 The Werkgroep ’72 (WG ’72) a Dutch foundation that supports development in Jakarta, has been working with Yayasan Kampung Kids (YKK) since 1999. 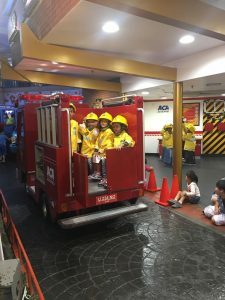 When I joined as project manager I was surprised to know that the initiatives of YKK that we support financially had little to do with ‘kids’ in the community. We support a weekly dance class for the senior members of the community and the provision of food that goes along with that class. Even though WG ’72 works on a project base, this program still seemed a valuable one. 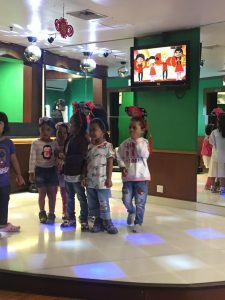 Allowing this group of the community to enjoy a weekly session and feel energized indirectly supports kids, knowing that many of the older members take care of the very young ones. Getting to know Julia our contact at YKK was a great pleasure. She was able to share the struggles many face in the community and highlighted the need for balanced meals especially for the younger members using the slogan ‘Food for Thought’. Not having a nutritious meal daily will leave kids tired and unable to grow physically and mentally. 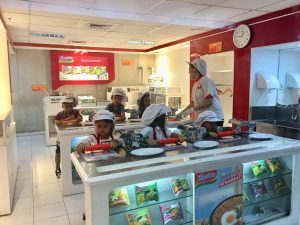 Despite some failed efforts to connect local chain stores with YKK, the WG ’72 is still looking for the best way to support the ‘nutrition program’ that is in place. The ‘nutrition program’ together with the ‘education program’ that allows kids 4-6 to go to pre-school, are the backbone of YKK and it is what keeps the WG ’72 involved. Speaking with Julia last May there seemed to be a new concern affecting multiple families in the community. A number of the mothers to kids aged 7-14, found that the digital distractions available to their kids were having a negative effect on their development socially and physically. We took this information to the following WG ’72 meeting and got in contact with ABAT. ABAT provides trainings related to the working, spread & prevention of HIV, but also helps patients and their family members, deal with emotional struggles. ABAT was happy to talk with YKK and this led to the ‘Agent of Change’ project that will commence on the 23rd of August, with a community gathering open to 20 mothers to create methods and best practices that will challenge their kids to use their electronic devices more responsibly. At the start, we at Kampung Kids would like to extend a sincere and heartfelt thanks to all our wonderful sponsors/donors and our tireless volunteers. Its your knowledge, funds and generosity that has helped us to run all our programs, in November 2018, we complete 19 years of our existence. There has been some unfortunate news in the past few months. We lost Pak Sugeng who had been running the ‘exercise for elders’ program for almost 5 years. Also, we lost some of our wonderful sponsors, namely Mrs. Beverly Wortham, Mrs Sanna Nylund, Mr. Oliver Osborn, and Husband of Ms. Marilyn Korber. We extend our deepest condolences to their families. May God give you the strength to cope with the loss. We also lost out on few sponsorship this year due to the unstable economic situation in Indonesia, specially the scholarship sponsorship. However, despite the setbacks we have been able to continue with our programs with the support of all our generous donors and volunteers. Its due to the word of mouth publicity from you all generous supporters that Kampung Kids has been introduced to new sponsors/volunteers. This support has enabled our students to continue with their study programs. 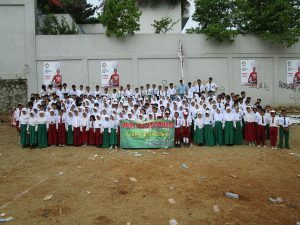 Jakarta Intercultural School (JIS) has been one of our regular sponsors since we started in 1999. Every year they hold an event called “Walk-A-Thon” to raise funds for Kampung Kids Students. This has helped many students to finish their high school education. We would like to thank each and every one of you and pray that God blesses you all with good fortune for your generosity. We are turning to 18 years old, we still run feeding programs (for students and elderly), classes (Pre-school, English, Playgroup and art), exercise for elderly and scholarship program. Many of our high school students have finished their studying and have been working and start to help their parents especially their siblings. 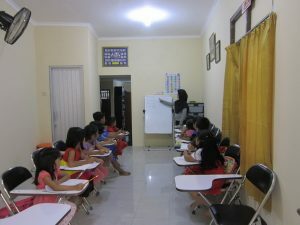 We would like to bring one of our graduated students, her name is Rizkika. We sponsored her studying from elementary school till finished senior high school and since last year she works and be able to help her parents. It was sad that her father got unemployed since last year due the company cut some staff even security, so her father loss his job. But fortunately Rizkika can assist her father’ problem and keep her siblings in school. We have many cases same as Rizkika’s. We are really proud of our students who had studied hard and now able to help their parents and even their sibling. We also are happy to inform that the junior high school in Pandeglang, Banten has been active since last July 2017. We helped the community to build the school building and starting this school year term, there are around 15 junior high school students joining with this school. From our deep heart, we would like to thank our donors who participated with the school building construction, your help and support really benefiting the children in this area to get education as others. Please allow us to thank you sponsors and volunteers who have been supporting and helping for years even some of them have been supporting since 1999, words are really not going to be enough to express our BIG THANK but may our God would keep blessing you and give you and your family great health. Firstly I would like to thank Kampung Kids especially my sponsor, Mr. Yee Kee Lam who has been supporting my education till I step to first year in university. I am so proud to be able to study in BINUS since this school year term. Please allow me to thank my parents as well who have been raising, helping and evening guiding me to this day. 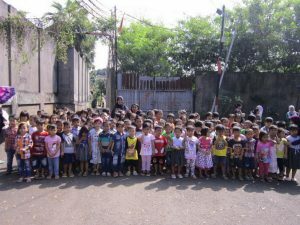 Kampung Kids has been helping since I was in elementary school through senior high school and then I continue my studying to first year of university, I will study hard to get great grade and then hoping I can finish my university degree in time then start to work and help my parents and siblings as I have 4 younger siblings. 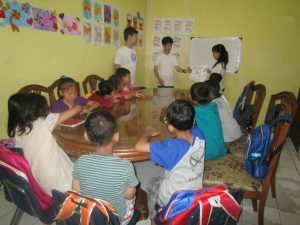 Again thank you so much Kampung Kids (Mr. Yee Kee Lam), I won’t be able to pay you back but I will study hard to get good grade and then will try to help under privileged children when I have finished my studying and works. As a representative of the Parents of the Students who are a part of the Kampung Kids “Pre-School Program”, I would like to say a BIG THANK YOU to Kampung Kids for all the benefits to our children. Due to lack of sufficient funds, we cannot send our children to regular kindergarten school. 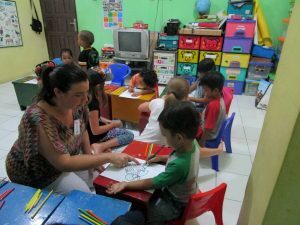 However, by joining their ‘Pre school Program’, our children are not only able to learn reading, writing and arithmetic for free but at the same time they are also learning to associate with other children of their age. Additionally, they also get the benefit of free text books, available to be brought home to study too. 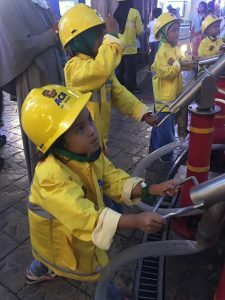 With all this preliminary training, by the time our children reach the age of 6 years, they are easily able to enter government run elementary schools. 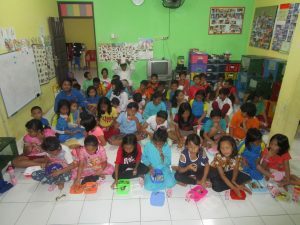 We, the parents, would like to take this opportunity to thank Kampung Kids as well as the sponsors who keep this program running and help us to provide good education for our kids. Ibu Sari (Sasa’s mother) translated in to English.